The daily schedule will be updated as events are confirmed. Stop by the Alumnae House registration tent to receive your welcome card with your housing assignment and meal reservations. Classes of 1939, 1944, 1949, and 1954 should register at Lamont House. 11:15 a.m.-12 p.m. College Presentation: Renewing Neilson for the 21st Century. 25th Reunion class social hour hosted by President McCartney. President McCartney will be visiting each class during Friday or Saturday dinner. 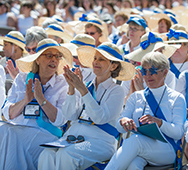 Alumnae participating in the parade are asked to wear white with white or light shoes. In the event of rain, the Alumnae Parade and Alumnae Association Annual Meeting will be held in the Indoor Track and Tennis Facility (ITT). The signal for such a change in venue will be the ringing of the college bells at 8:15 a.m. Alumnae should enter through the main ITT entrance, look for their class year signs along the far wall and line up with their classes. Alumnae Parade Alumnae march along Seelye and Neilson drives toward the Campus Center and onto Chapin lawn. Lunch will be distributed near Hatfield Hall. Check your class schedule for class programming. Campus activities organized by various departments (Museum, Botanic Garden, Libraries, Athletics).